Mount Moran is like an awesome history book if you know how to read it. Mount Moran reflected perfectly in the still waters of Leigh Lake in Grand Teton National Park. From the canoe it seemed that we could almost touch the rugged cliffs and read the long history of the mountain in the surface of the water. The geologic record of the Tetons is well chronicled in Mount Moran. From the top of the summit to its base, it reads like a book, although there are pages that may seem out of order. The story of Mount Moran starts long before there was even a hint of mountain. Two and a half billion years ago, the entire area was deep under a vast deep sea. Starting with sand and volcanic ash, sediments were deposited to incredible depths over millions of years. Heat and pressure metamorphosed the bottom sediments into gneiss, the hard weather resistant rock that forms the backbone of the Teton Range. We could clearly see a black vertical line slicing down from the top of the mountain. This 150 foot wide black dike, made of diabase rock, was injected as igneous or molten rock into cracks in the gneiss while still a part of the seafloor. This same process created the other igneous rock in abundance in the Teton Range: granite. Seventy million years ago, when the Farallon Tectonic Plate collided with the North American Plate, the earth’s crust buckled and crumpled forming the Rocky Mountains. But the Teton Range, while no longer part of a sea, remained a vast plain for another 60 million years. It was a stretching continent that finally triggered the Teton fault to shift. In the first episode, the west side of the fault jumped upward perhaps ten feet while the east or valley side dropped three to four times that much. Mount Moran and its sister peaks were born and continued to grow each time the tension was released through a violent earthquake. As the mountains rose, the thick layers of sediment eroded down into the valleys until the underlying gneiss and granite remained. From the lake, one of the most telling pages in the geologic book was hidden from view. The cap of Mount Moran is Flathead sandstone, a sedimentary deposit found 24,000 feet below the valley floor below. Each shift of the fault separated the pieces of the layer a little more. The offset between the mountain range rising and the valley floor dropping was a whopping 30,000 feet. That the difference of peak to valley is currently only 6000-7000 feet is telling: the steady forces of nature including erosion, volcanic ash and glaciation all filled in the valley. From the glacially created Leigh Lake, we could easily see the Falling Ice Glacier, one of five glaciers on the mountain. These are tiny reminders of what was once a powerful force in shaping the mountain and surrounding areas. Glaciation occurred three times, starting about 150,000 years ago with an ice pack up to 2000 feet thick. 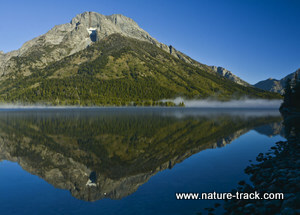 In Mount Moran is the story of the creation of the youngest mountain range in the Rocky Mountain chain. It is also a story whose ending has not been written because although we can’t see them, these processes continue today.